Check out our range of exclusive, licensed Jack Daniel's Pool Table Cloths, they come in a range of sizes to fit your table. We can supply the cloth to you or we can fit it for you as well. Jack Daniel's pool table cloths are perfect for anyone looking to sport the iconic brand on their pool table. All of our Jack Daniel's pool table cloths are of the highest professional quality are fully licensed and are exlusive to Home Leisure Direct within the UK and Europe too. The cloths come in many sizes and types. Sizes range from 7ft all the way up to 9ft. The types of cloth include Elite Pro Cloth and Smart Cloth so that you can get the suitable cloth for your playing style. 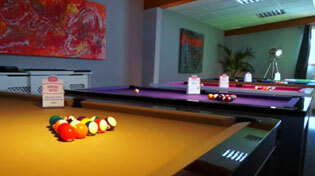 The Jack Daniel's pool table cloth range is supplied by leading cloth manufacturer, Hainsworth. Their pool table cloths are finely 'engineered' for optimum playing performance and long lasting appearance too. We can supply the Jack Daniel's pool table cloth to you in a size that is suitable for your bed and cushions, in which case you will need to arrange fitting yourself, or we can fit the cloth for you and take all the hassle out of the job. Simply select the "Fit to Existing Table" option within the product listing when buying your cloth, and we will arrange to come to the table, fit the cloth to both bed and cushions, and leave you with a freshly re-covered table with a Jack Daniel's cloth that is ready for the first of many games. All of our Jack Daniel's pool table cloths come with free delivery to mainland UK. However, for locations outside the UK mainland there may be an additional charge depending upon your exact location. Please call our friendly customer service team on 0800 622 6464 for a quote. If you have any questions about the Jack Daniel's pool table cloths we sell, or about any of our other products, please give us a call on 0800 622 6464 or 01454 413636 and one of our friendly expert advisors will be happy to help you.